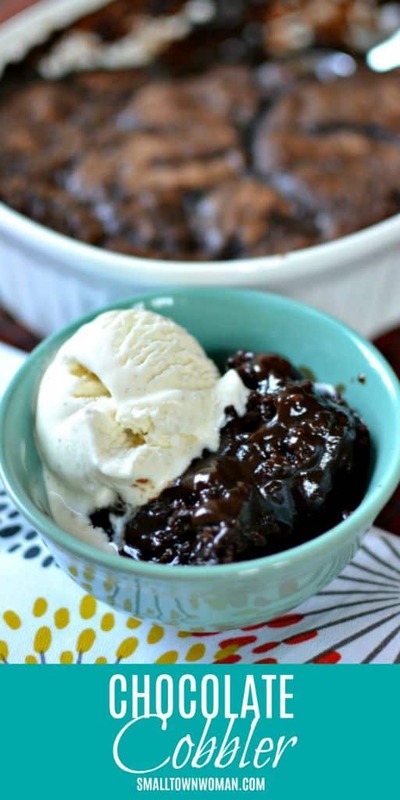 Chocolate Cobbler is a Southern super easy no fail chocolate lovers dream come true. It is like a cross between a brownie and a hot fudge sundae. So grab a spoon and dig into that hot chocolate mess. Better yet top it with a heaping scoop of vanilla ice cream before you indulge in that baby. 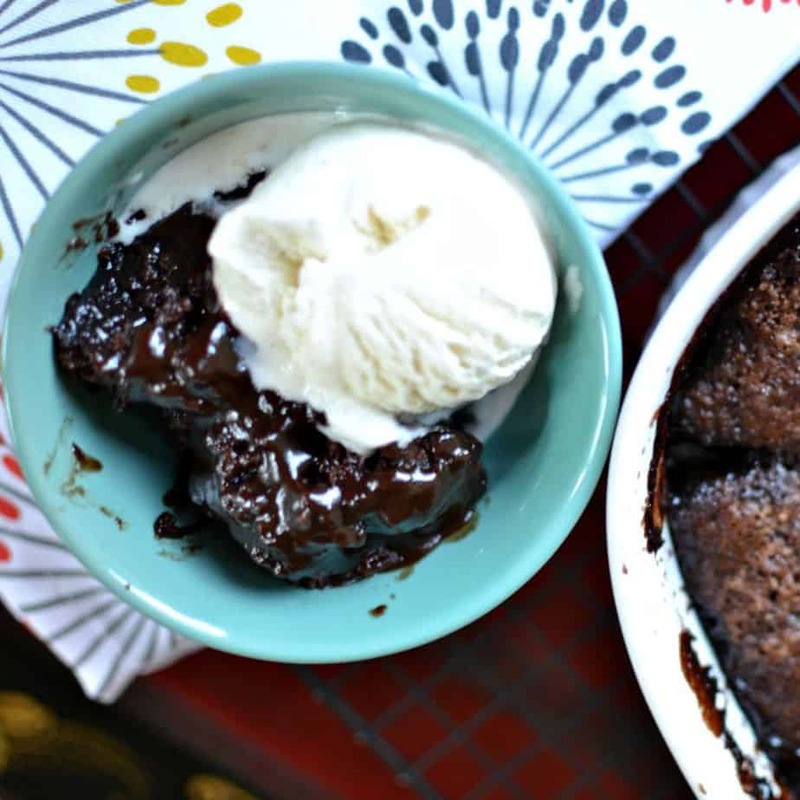 Oh this Easy Chocolate Cobbler Recipe is just heavenly. It is one of my families favorites. It only takes just a few minutes to put it together and the results are well worth the effort. I love whipping this up for unexpected company. Everyone loves a decadent creamy chocolate pudding cake dessert. 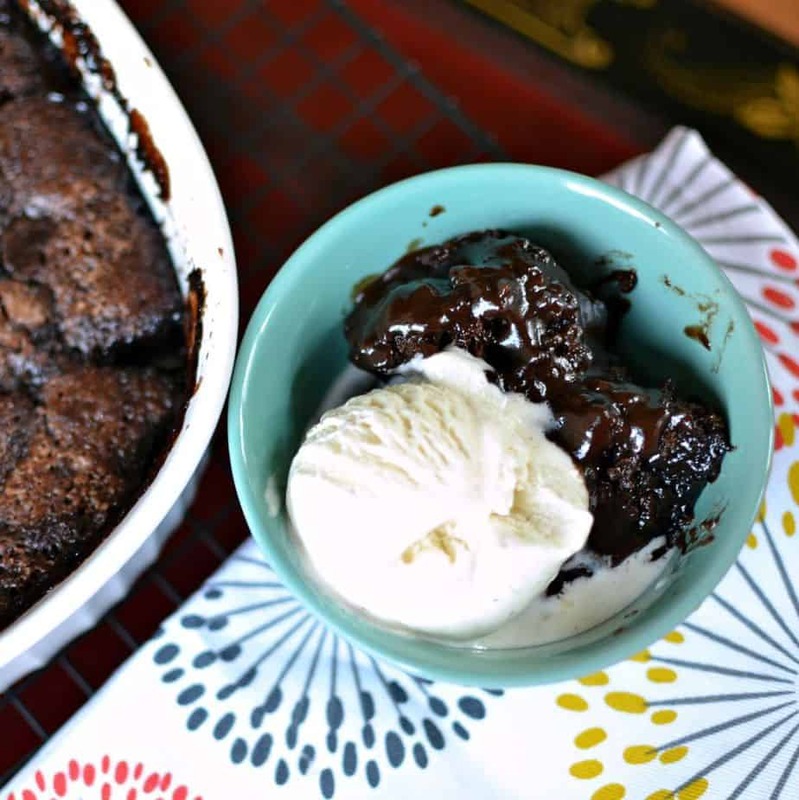 How do you make Chocolate Cobbler? Start by greasing the sides of an eight or nine inch square baking. You can also use an equivalent sized casserole dish as I did. Pour the melted butter in the bottom of the baking dish. Then in a medium bowl whisk together flour, baking powder, salt, sugar and cocoa. Now stir in the milk and vanilla and spoon into the baking pan on top of the butter. However do not mix it in. Then whisk together sugar, brown sugar and cocoa. Sprinkle the mixture evenly over the batter in the pan. Again don’t mix in. Finally pour that almost boiling water over the top. Again do not mix in. Bake for around thirty to forty minutes or until the center is mostly set. Please keep in mind that this is a ooey gooey dessert so the toothpick test does not work and it will not be completely set in the center. If desired serve a la mode. Use good quality cocoa. I personally prefer gourmet Dutch processed baking cocoa which I purchase from Costco. The added water should be brought just right up to a boil. Do not over-bake this cobbler. Since this dessert is a gooey chocolate mess it will only be semi set in the middle. This dessert is best served warm or at least at room temperature. If you love chocolate this is a must. By the way who doesn’t love chocolate? Well what are you waiting for? Go get that darn spoon! I hope you and yours love this treat as much as we do! This post was originally published July 25, 2016 and was republished March 22, 2019 with new content. 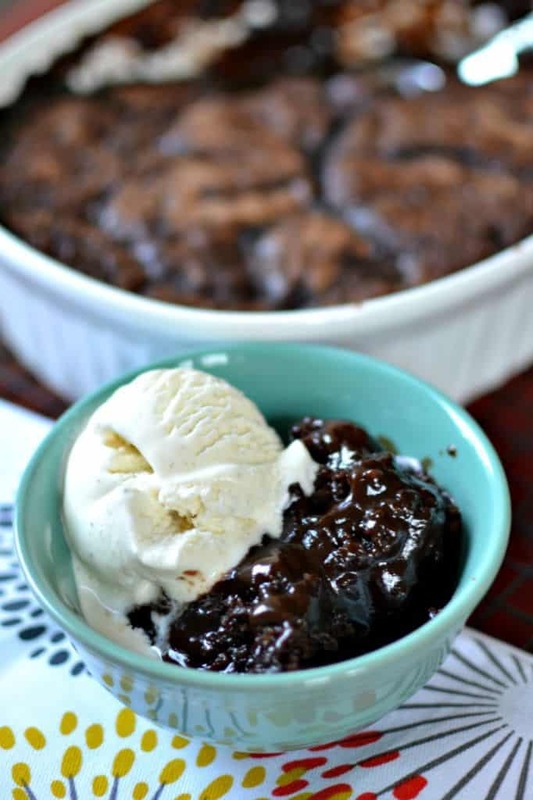 This Easy Chocolate Cobbler is an easily prepared decadent creamy chocolate pudding cake dessert that your whole family is sure to love. Grease an 8 x 8 inch baking pan. Pour butter in bottom of the baking pan. Mix in medium bowl flour, baking powder, salt, 3/4 cup of sugar and 3 tablespoons cocoa. Add milk and vanilla. Stir to combine and spoon into the baking pan on top of the butter. Do not mix in. Combine 1/2 cup sugar, brown sugar and 1/4 cup cocoa. Sprinkle evenly over the batter in the pan. Don’t mix in. Slowly pour boiling water over. Do not mix in. I use my 1 1/2 quart Corning-ware oval baking dish and it works perfect for this recipe. Would it work to put frozen cherries in this recipe? Everyone went crazy over this! It was like cake and pudding combined. Can’t wait to make it again! Thanks Samantha! I am glad that you enjoyed it! What a great sweet treat! With some vanilla bean ice cream on the side? Yes please! I am drooling. This chocolate coobler is the bomb! I am making this asap. Thanks Becky! I hope you enjoy it! My chocoholic family loves this! So good warm with a scoop of vanilla ice cream! My family is full of chocoholics and this did NOT disappoint! So amazing! How did you know I was craving chocolate today? This hit the spot! This is the most dreamy chocolate dessert I have ever had. It was superb! The chocolate lover in me is doing a happy dance! I love how easily it comes together! This dessert never gets old! Forever going to be making this. 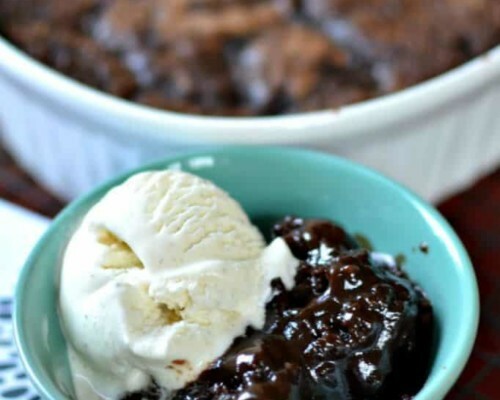 I’ve never had chocolate cobbler before but this sure looks good! It reminds me of the chocolate gravy my granny made for us when I was growing up. I definitely need to give this a try! I love it! So easy to make!! This cobbler looks like a chocolate lovers dream! I can’t wait to make it this summer.